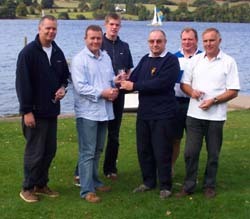 The Finn Class met at Ullswater SC on 4-5 October for their Northern Championship. A weather forecast of gales proved to be exaggerated and sunshine greeted the fleet on their arrival, the wind varying from Force 1-4 in any direction. Four races were held on the Saturday, two traditional Olympic-type and two figure of eight courses. Phil Laycock won the first race from Russ Ward, the second race was won by Mark Andrews from Phil Laycock with Russ Ward sailing through the fleet to finish third. Race three took place in shifty conditions with most competitors holding most positions at some stage but again Andrews led from Laycock with Russ Ward retiring. The final race of the day saw some ferocious weather and a close battle between Glover, Andrews and Laycock. Laycock gained water at the last mark and as the boats rounded and headed for the finish a force 6 squall with hailstones hit the fleet. Andrews capsized, Glover was knocked flat and Phil Laycock managed to stay upright holding on to win from Keith Fedi who came through at the finish and Stuart Glover. As Sunday dawned to a hard frost and sunshine, it was obvious that the title lay between the experience of the resurgent Laycock and the talent of the young Andrews who wanted to add the Northern Crown to his Scottish Championship win a few weeks earlier. So the day proved, race five was held on a conventional Olympic-type course with Andrews leading from the start and with clear air decisively beating Laycock with Justin Chisholm third. Thus preparing for the final showdown for the title with three other boats fighting for third spot. In mixed conditions, with a shifty wind, local knowledge paid off with Laycock leading from start to finish and comfortably winning the race from Andrews and Glover, who was at last mastering the shifty lake conditions. Phil Laycock was therefore crowned Finn Northern Champion from Mark Andrews with Keith Fedi taking overall third on count back from Glover and Chisholm.